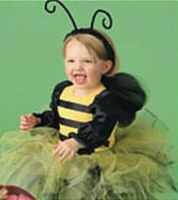 #C156 Two piece costume with headband. Long pants with gathered waist and ankles. Top has contrasting trim. Wings, tutu and headband are included.